'We have overcome hesitations of history' Jump to media player Narendra Modi has given a speech to lawmakers on Capitol Hill in Washington. Why does Modi's speech to Congress matter? Jump to media player Narendra Modi's Capitol Hill speech gives his fourth visit to the US in two years extra significance, as BBC News explains. Modi heads to Brussels Jump to media player Indian Prime Minister Narendra Modi is heading to Brussels to discuss an India-EU free trade deal. But what impact could a UK exit from the EU have on India? India's budget explained - in 5 seconds Jump to media player The BBC's Yogita Limaye tries to explain the importance of Indian Prime Minister Narendra Modi's second full budget - against the clock. Narendra Modi has given a speech to lawmakers on Capitol Hill in Washington. The Indian prime minister is on a three-day visit to the US. 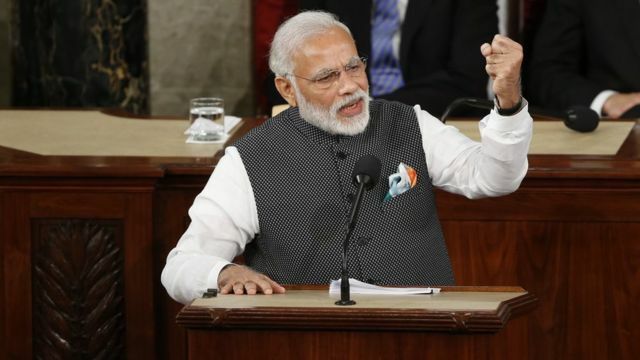 Speaking to Congress, Mr Modi praised the growing relationship between the US and India. Go to next video: Why does Modi's speech to Congress matter?